A Derbyshire driver will have to undergo anger management counselling after a road rage incident when he assaulted a van driver. 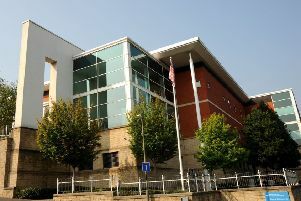 Jacob Graham Orton, 25, of Bridge House Farm, Chatsworth, admitted assaulting Aaron Willis by beating and to using a vehicle without insurance or a full licence in Orby, Skegness, when he appeared at Boston Magistrates’ Court. Prosecuting, Dan Pietryka said on the afternoon of October 6, van driver Aaron Willis left the village of Orby. He said Orton, in an Audi TT car, came up behind him, before overtaking, swerving towards him and giving him a ‘V sign’ out of his window. Mr Pietryka said Mr Willis had to slam on his brakes and try to avoid the Audi but clipped the wing of the car which then spun round and partly went into a ditch. He said Mr Willis went to ask Orton if he was OK, but Orton hit him in the face ‘four or five times’ and shouted at him that he had tried ‘to kill my missus’. He said Mr Willis collapsed onto the ground and then found Orton on top of him striking him several more times. Mr Pietryka said Mr Willis had lost his job because he had to take time off work. In interview with the police, Orton said the van had been swerving and braking . Mitigating, Kirsten Collings said the defendant has no recollection of the assault but when he got out of the car he believed that his partner was dead and there was a total loss of emotional control. She told magistrates Orton had passed his driving test but never received his full driving licence and had not queried it. Orton was given a 12-month community order with a requirement to undergo anger management. He was ordered to pay £200 compensation, £170 costs and £100 fine.